The person who conducts your wedding ceremony is also the one who oversees the most fundamental part of your wedding day. It is crucial you get to know each other and that you as a couple feel comfortable having him/her conduct your vows. Here are some tips to ensure you get the officiant you want. DO YOU WANT A RELIGIOUS OR SECULAR CEREMONY? The right choice of your officiant is a no-brainer. Wedding officiants are the ministers who will orchestrate your wedding vows and ensure your marriage is valid and meaningful - to you both as a couple, to your guests and family and in the eyes of the law. Choosing an officiant who cares about your particular perspective and wedding makes a huge difference in the wedding ceremony. 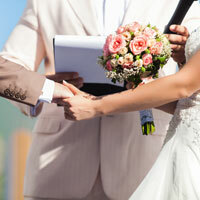 A wedding officiant could be traditional, progressive, religious or secular. They may have experience in a range of various backgrounds but how they officiate your ceremony can integrate all the different aspects of your union. Wedding officiants assist you in how you exchange your vows and they will develop the narrative on the love you share and the commitment you are about to make. They should have some insight into your background and elaborate on the path you are choosing to explore together. Some couples want the service to last for hours so you may need an eloquent speaker or a sermon. Some will require the officiant to give ceremony readings while others want a short, sweet ceremony. Either way, the officiated wedding ceremony is the central and most special event.